Made acrylic bathtubs for the home. Breathing fiberglass all day long. A nasty job by all standards. They were heavy, sturdy and strong. The conveyor line never stops. Never get a small break. At least 90º in the shop. On the radio, talk of a raft race. 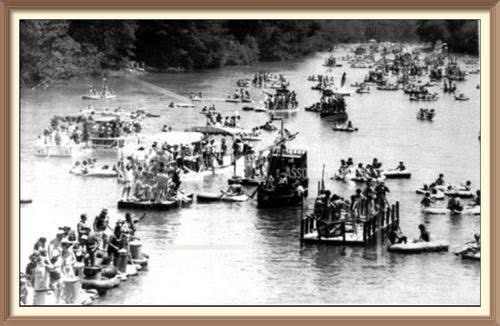 Chattahoochee raft race is in town. the line of tubs that never slow down. Me and my buddies worked together. Didn't really think this thing through. and us three idiots became the crew. The raft built from a broken tub. A base constructed to walk around. S.S. Tocomc painted on the side. It weighed about a thousand pounds. The morning of our departure. Used a fork lift to get on the truck. just relying on plain old dumb luck. Forgot to register S. S. Tocomc. Starting line was off limits to us. next to ten hippies in a Volkswagon bus. Took an hour to get off the truck. I wish I had just gone to the mall. Finally in water and drifting. With no way too steer it at all. Two hours of wandering downstream. so much for our pathetic design. no idea where we'd wind up. along with his beer filled solo red cup. Had to pull him in by his sneakers. Thought he was going to drown. This trip becoming a nightmare. Trees and water, no one else was around. We heard rough water ahead. Getting louder and louder the sound. We panicked and jumped overboard. Swam to the bank and sat down. First time it turned when we wanted. We wound up on ground unexplored. The raft parked itself on dry land. and we were not even on board. Hiked for the next several hours. Walking through sun and rain showers. A cool dude in a pickup drove by. Offered us a ride and some lunch. I had no idea where our truck was. He was a river rat and had a hunch. In bed and slept like a brick. Swore never to do this again. Hasta la huego, S.S. Tocomc.